This page is written with deep appreciation for your aspiration, and the goodness that can come in its fulfilment. It should answer some common questions related to how your aspiration might unfold and what conditions should be met for bhikkhuni ordination. Women have a few additional requirements for ordination that men do not. These requirements were called for by the Buddhist women's monastic community for its own welfare during the Buddha's lifetime, according to the circumstances that these early Buddhist women encountered. They are practical, mostly stemming from compassion for children and women's special role as mothers and in giving birth. Other than this, most important is that the aspirant be basically mentally and physically capacitated, not incapacitated. Also that she be free from debt and other forms of social/societal and familial obligation/duty/service. Again, according to Vinaya, the process is virtually the same for men and women. The first three stages may vary a little from monastery to monastery, and might vary more from tradition to tradition. Other than the probationary novice stage, the latter stages are very much the same everywhere in Buddhist monastic life. Every monastery has a slightly different mood and mode of monastic life. Some are in the city or suburbs, some deep in the forest or desert. Some are large, some very small. You may see what you feel is right for you, what you feel called to. Sometimes this evolves and changes over time. If you are interested in monastic life and have further questions after reading here, please do contact us at our Dhammadharini Vihara or Aranya Bodhi Hermitage, or one of the monasteries linked to directly below here. Normally, a man or women would come to stay at a monastery where they think they would like to train. Sometimes they visit several monasteries to find where seems best. Most monasteries allow someone to stay to see if they feel well there initially for one week or two weeks. Here at Dhammadharini Vihara and Aranya Bodhi Hermitage, we allow two weeks, or even longer. If one feels inclined to stay and enter into the training at a particularly monastery, they should make their aspiration known to the teacher, abbot or abbess there. If it is agreeable to the teacher and the monastic community, the aspirant is welcomed to return. Upon their return they undertake the eight precepts (if they hadn't already) as a pre-postulant or nekkhamma, normally with an as yet unshaven head, wearing white or black and white clothing. The pre-postulant's eight precepts are the same as the layperson's five precepts plus three additional renunciate precepts, as well as the significant change in the 3rd precept from no sexual misconduct, to brahmacarya or no sexual conduct whatsoever. After staying for some time as a pre-postulant (normally 2 weeks to 2 or 3 months), if both the aspirant and the teacher as well as the monastic community feel amiable about going ahead, the aspirant may request ordination as an anagarika. Anāgārika means homeless one due to their having left home life, sought refuge and being accepted as postulants in the monastery. In English we call anagarikas at this stage "postulants, aspirants" or "candidates." Anāgārikā (with a long "a" at the end) is the female form, anāgārika the male form. The anagarika has a shaven head, wears white robes and keeps the 8 precepts. The anagarika period is normally around a year, but sometimes can be as little as six months, or as long as several years, depending on individual circumstances. As a postulant, one is still officially a lay person, and as such still able to use money, hold property and finances and support oneself. Although normally lodging and food are shared by the monastic community with anagarikas at a monastery, special health care needs, travel (not related to the training) or other such expenses, are still covered by the anagarika herself. Most nuns in Burma and Thailand, for whom novice and full ordination has not been available for some time, live as anagarikas for short-term or long-term monastic retreat in this way with the "uposatha" eight precepts. Thai, Lao and Cambodian angarikas are called maechees and donchees. In Burma the anagarikas may wear light-pink, peach or dark-brown colored robes and are called Sayalay or thilashin. A samaneri is a female novice samana, or a samana-in-training. A samana is a monastic recluse. Samaneri is the female form of the word; samanera is the male form. After an average of a year as an anagarika, with the approval of her teacher, an anagarika may request the samaneri pabbaja, the "going forth" as a novice into the monastic life. If an aspirant for novice ordination is under the legal age of adulthood (or age 20), she must have the permission of her parents or guardians in order to receive novice ordination. Novices undertake the ten novice precepts, which include 8 precepts plus the additional precept of not handling or keeping money. In most forest monasteries, novices also no longer drive cars. The novice precepts and training are exactly the same for male and female novice trainees. In addition to the going forth, a novice also takes "dependancy" upon the elder Sangha member who will be her acariya - her personal teacher, mentor and guide through the ordination process. Again, in the absence of bhikkhunis, bhikkhus are both permitted and enjoined by the Vinaya to give both the novice and probationary novice ordination to qualified women candidates. In the currently (at least in the West!) very rare event that a woman has married very young, or become a novice as a young girl, she might be qualified to be ordained as a sikkhamana from age 10 or age 18 respectively. For a child bride, having proven her maturity and responsibility by completing 2 vassas of the sikkhamana training, she may be fully ordained as a bhikkhuni even before age 20. The Vinaya normally considers age 20 to be the age of adulthood, at which time one may, if having met all requisite conditions, request full ordination, the bhikkhuni upasampada, from the monastic community. It is noteworthy that, in some Thai, Korean, Chinese and Tibetan tradition monastic communities, women currently receive and complete the sikkhamana ordination and training for two years before fully ordaining, no matter what their age. A bhikkhuni is literally an almswoman or female alms mendicant. Bhikkhuni is the feminine form of bhikkhu. In Thailand and Burma, bhikkhunis are known as phra pu-ying or rahan-ma -- female monks, while in Sri Lankan and most places where Christian monasticism has had strong influence as fully ordained nuns. In the case of bhikkhunis, this is a difference of word use only and varies from place to place as the language use has not yet been completely established in our Western context. Bhikkhunis have the same livelihood and all of the duties, rites and responsibilities as bhikkhus in Buddhism. After an agreed-upon period of samaneri and/or sikkhamana ordination (at least 1 year or 2 vassas), with the recommendation of her teacher, a novice may request the bhikkhuni upasampada, the full or higher ordination, from the Bhikkhuni Sangha, and then confirmation from the Bhikkhu Sangha. The novice must have the permission of their husband to be fully ordained if she is still legally married. The novice's full ordination begins with her request to her bhikkhuni teacher/preceptor - pavattini or a bhikkhu preceptor - upajjhaya, followed by her preceptor's proposal to the Sangha. The candidate also has an additional 4 supporting teachers from the Bhikkhu and Bhikkhuni Sanghas to guide her through the ordination process. She is accepted as a full member of the Buddhist monastic Sangha by the Sangha itself, not by any individual, thus at least five members of both the men's and women's monastic community must be present to grant acceptance (4=Sangha, 4+1 teacher=5, 5 bhikkhus + 5 bhikkhunis = 10). More Sangha members may participate in the ordination as witnessing masters, however, only 10 are required, unless one is in India's heartland, the Madhyadesa, where the Buddha lived and taught. There at least 10 members of the Bhikkhu and Bhikkhuni Sanghas must come together = 20 (Mahasangha) to give the ordination. 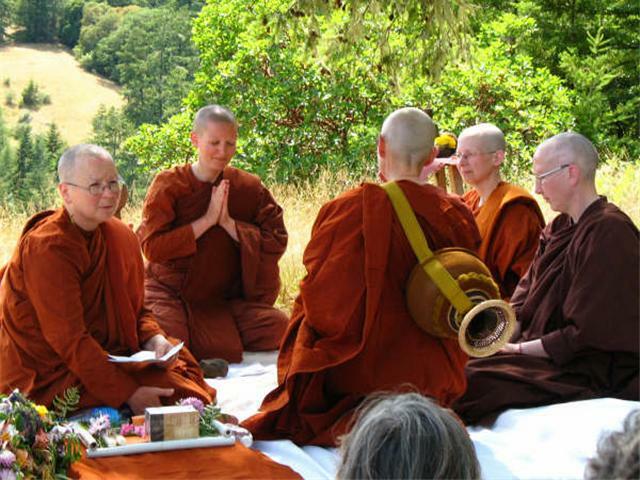 When there are no bhikkhunis available, the Vinaya allows the Bhikkhu Sangha alone to give the ordination. Theravada bhikkhunis, once fully ordained, train themselves with the 311 precepts of the Bhikkhuni Patimokkha; Theravada bhikkhus with the 227 precepts of the Bhikkhu Patimokkha. More than 60% of men's and women's monastic discipline of the Patimokkha is held in common, and nearly 90% of the greater body of Vinaya discipline is shared. The differing numbers do not relate to any greater or lesser merit, as the Vinaya affirms the two disciplines are the same in essence. Rather, the bhikkhunis in the Buddha's lifetime, due to their own sense of what was best for the discipline and protection of their monastic communities, called for most of their own unique precepts as circumstances arose for them. Additonally, some of the precepts are combined or seperated differently with several bhikkhuni precepts of a common theme being combined into one in the bhikkhus' discipline. Valid full ordination, the upasamada, is good for one's entire life, unless one renounces the ordination and disrobes, or commits a parajika offence which nullifies the ordination. Bhikkhus who honorably disrobe may later request reordination. Bhikkhus or bhikkhunis who commit parajika offences while in the robes are not able to reordain in this lifetime. The Bhikkhuni Sangha has existed since the Buddha's lifetime and continued into the present in China, Korea and Vietnam. Modern South and South-east Asian Buddhism is currently seeing a revival of this ancient women's monastic tradition, initially in the West and in Sri Lanka, now followed by Thailand. Sri Lanka currently has more Theravada bhikkhunis than any other country in the world. Once ordained as a bhikkhuni there are several main stages in one's monastic life. The first is that of a nava or new bhikkhuni. A new bhikkhuni should stay, train with, serve and support her mentor/teacher for at least 2 vassas. After completing at least 2 vassas training, if she is ready, complete in knowledge and ability, her mentor may grant her independance. If she is not yet ready, her teacher may wait until she is for independance to be granted. In some communities, the requirement of 2 vassas in increased to 5. Five vassas are required before independance for the bhikkhus in their monastic rule. Once independant, a bhikkhuni is free to travel and train where she herself feels is best for her. Sometimes bhikkhunis stay with their mentor their whole lives, sometimes they travel a little, sometimes for many years, rounding themselves in the training with various teachers and at various places. Sometimes they return to their original mentor after several years, sometimes not. This is very individual. 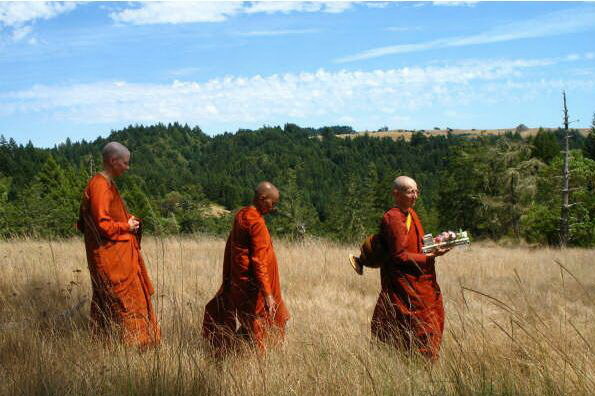 Vocations in Buddhist monastic life, after completing the basic training, are discerned by the individual monastics themselves, although they may be in conjuction with the advice of their teacher or mentor. A bhikkhuni should see for herself whether more secluded meditation, further in-depth study of Buddhist texts or service to the monastic community or lay community are most conducive for her development and higher training in sila, samadhi and panna. After 5 years, a bhikkhuni is known as a majja bhikkhuni or bhikkhuni in the middle years. During this time, she may continue to develop herself in her training through various experiences. She may also, with community approval, begin to instruct novices. A bhikkhuni may have any number of teachers, or only one. Also, in the Sri Lankan and Burmese Forest traditions as well as the Vipassana meditation tradition, a monastic may have come from any Nikaya or ordination lineage, but is a member of the practice tradition in which s/he lives and trains. It may be that monastics are asked to reordain, or strengthen and reaffirm their commitment to the practice of the Vinaya when coming to live and train in monastic communities particularly strict in monastic discipline if the parctice varies significantly from where she originally ordained. After 10 years in monastic life, a bhikkhuni becomes a Theri or Elder. It is normal, for those who have the propensity, to begin to teach within the monastic community and to the public at large at this time. It is also from this time that one may begin to accept and ordain novices as one's pupils as well as undertake monastery administration such as as an abbess or assistant abbess,although this may happen earlier or later under varying circumstances. From 12 vassas after full ordination, a bhikkhuni, if agreed upon by her community, may also participate as pavattini or teacher/female preceptor in granting women the full bhikkhuni ordination and take part in their training. From 20 years as a bhikkhuni, a Buddhist monastic woman may called a Mahatheri, or "great Elder." Theri is the feminine form of the word, Thera the masculine. The word Thera may be familiar from the word Theravada, the Teaching of the Elders, generally thought to be the oldest school of Buddhism. It may also be familiar from the world's first recorded collection of monastic poetry still existant, the Verses or Songs of the Elders, the Theragatha and the Therigatha. Theris and Mahatheris may be reclusive or often they may be active as teachers, leaders and guides of the Sangha. They may be particularly sought after by the lay and monastic communities if they have teaching abilities and/or special talent and affinity for training fellow monastics. or at one of the monasteries on the list above or here. * Ayya Adhimutta's "Going Forth"